Sean DeCrane is a 25+ year veteran of the Cleveland Division of Fire. He has risen through the ranks and currently serves as a Battalion Chief covering Cleveland’s Westside. He has served as the Director of Training and Acting Chief of Operations. Sean has been very involved in fire research at Underwriters Laboratories (UL) and the National Institute of Standards and Technology (NIST). He serves on the UL Fire Council, is a member of the UL Fire Fighter Safety Research Institute’s Advisory Board, and is currently on a number of technical panels for research and standards. 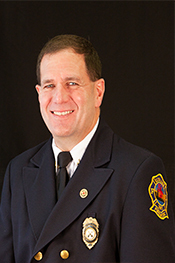 Chief DeCrane also represents the International Association of Fire Fighters (IAFF) in the International Code Council process and has served on the 2009, 2012, 2105 and 2018 Fire Code Developing Committee and as Chair for 2015 and 2018. Sean serves on the NFPA 1 Technical Advisory Panel, NFPA Research Foundation on Tall Wood Buildings, and was recently appointed as the IAFF alternate to the NFPA Fire Behaviour Research Technical Committee. Sean was recently awarded the 2015 UL Council Member’s Achievement Award, 2014 Fire Equipment Manufacturer’s Fire Safety Advocate of the Year Award, the 2013 International Association of Fire Chiefs Life Safety Award and the 2012 ICC-IAFC Life Safety Advocate Award. Sean recently was the keynote speaker for the 2015 Fire Department Instructor’s Conference.